iPod vs Zune: A Buyer's Guide focused on the usability and features offered by the iPod and Zune. Finding reliable information tends to be difficult because facts are often overshadowed by marketing fluff and spin. Apple’s iPod has been so heavily marketed that it has become one of the best known brands, usurping the position of Sony’s Walkman. Microsoft is working hard to get attention for the Zune in a crowded market. When push comes to shove, Microsoft has no problem fighting dirty. Here’s a look at its tricks. One major difference between the iPod and the Zune is the amount of information available. Apple's iPod is everywhere, and has been extensively reviewed over the last five years since its introduction in 2001. 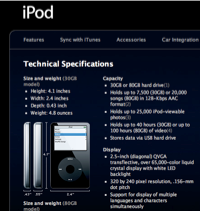 Go to Apple's website or ipod.com, click on Tech Specs, and every technical specification is plainly listed, from its exact measurements, to the audio and video formats it supports, to the battery playback time, supported languages and other features. The Zune is brand new, but finding accurate information on it still seems to be more difficult than necessary. Don't try zune.com, which currently brings up a "directory listing denied" message in Spanish. Microsoft opted for Zune.net. Why? Surely Microsoft is aware that the .net web addresses are intended for Internet service providers. Finding the straight details is a bit tough even on Microsoft's official site. The Zune Fact Sheet in the press area sounded promising, but it requires downloading a Word document. Holy cow, somebody tell Microsoft that basic information can be put on the web using HTML! 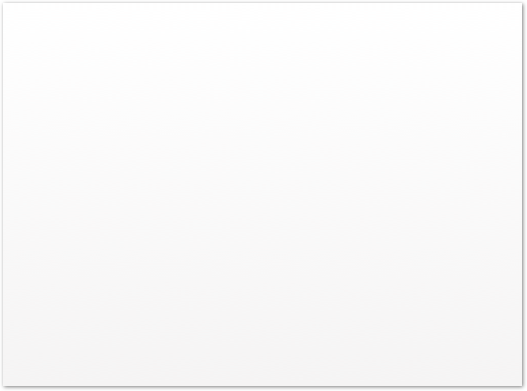 After downloading the file, I found it's just marketing adspeak. No clear specifications or details on requirements or how anything actually works. If it can't figure out how to present basic information, why can't Microsoft just copy Apple's iPod web site and change the details? "Zune is easy to use and easy to love. You can choose one of three base colors, each combined with a distinctive double-shot finish created by the overlay of one color on another." I thought this was a particularly effusive language used to describe the front of the player. The "double-shot finish" is actually its translucent plastic lid, which looks a lot like a Tupperware cover. When the truth hurts, its best to cover it up and hide details behind irrelevant smokescreens and flamboyant spin. Reviews of the Zune in newspapers and on television have generally rated it poorly. In an appearance on CNN, Miles O'Brien asked, "Why don't they get some decent design people to make the thing look better?" Given all its problems, its no wonder why Andy Ihnatko of the Chicago Sun-Times summed up his impression of the Zune by writing: "'Avoid,' is my general message." Oh the Humanity! Even Paul Thurrott isn't impressed with the Zune, calling its pricing strategy the “makings of a disaster.” Misery! Not only has the Zune suffered a horrific wreck of a product introduction, but Annie Wilkes is at the foot of the bed saying she doesn't approve of how things are going. There are a number of fan sites that sound excited about the Zune, but a big part of that excitement stems from the fact that those websites were set up by Microsoft as astroturf. They are really just advertisements pretending to represent real people, created by Microsoft to generate buzz. This is similar to the scam Microsoft pulled with its own imitation of Apple's Switchers ad campaign. 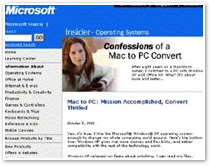 Titled “Confessions of a Mac to PC Convert,” Microsoft's ad portrayed a professionally dressed woman complaining about her Mac, but ended up being a canned picture pulled from stock photography and voiced by a professional writer. Astroturfing doesn't work reliably in the area of technology. As Abraham Lincoln observed, "You can fool some of the people all of the time, and all of the people some of the time, but you can not fool all of the people all of the time." It turns out that technically oriented people are less likely to be fooled by the impassioned ploys that are more at home in politics. 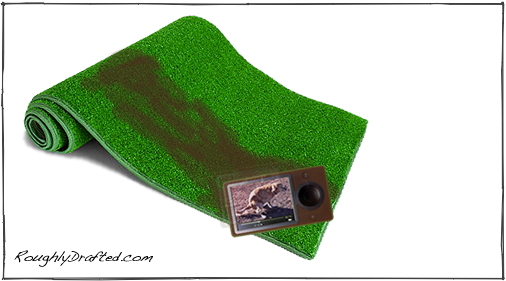 Somebody should inform Microsoft; the company has a long history in using astroturf. The LA Times exposed Microsoft for sponsoring fake letter writing campaigns intended to create the illusion of populist support from individuals during its Windows monopoly trial. Minnesota's Attorney General Mike Hatch called Microsoft's astroturf campaign "sleazy," saying, "This is not a company that appears to be bothered by ethical boundaries." Back then, Microsoft was sending letters with fake return addresses or using the identities of people who were dead. Today, Microsoft's "people" sit in chat rooms and post anonymous comments on the web or use email addresses that don't reply. In addition to pleading for political support using fake identities, Microsoft also directly pays organizations to lay down astroturf in orchestrated campaigns and spew FUD at rivals. After spinning off its XENIX product to form SCO, Microsoft famously used the corporation of lawyers to attack Linux in a massive FUD campaign designed to discredit Linux development and question its legal legitimacy in the press. Industry analysts who work as clients for Microsoft regularly solicit interviews with reporters, offering their take on why Microsoft will ultimately dominate in every product category, despite mounting evidence to the contrary. 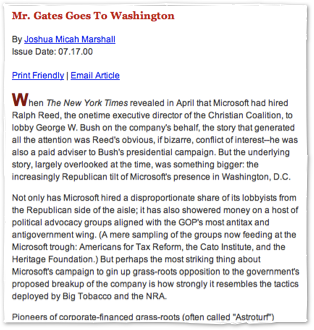 Microsoft exploits the media’s fragile remnants of integrity with ready to print opinions paid for and prepared by the company; lazy journalists are eager to reprint them in exchange for their remaining credibility. The latest trick has been to coach users on news aggregation sites like digg.com to ban articles that print anything challenging the company's methods, practices, and products, and promote its talking points. Microsoft also sponsors popular news sites and podcasters, with the proviso that when they post Microsoft’s logo and advertisements, they must accept a "license agreement" that prevents them from making any critical mention of Microsoft or its products on their site or broadcast. Fortunately, Microsoft does its typical sloppy job even with astroturfing, so it's generally easy to spot. Paid placements almost always recite the exact same "talking points," the easy to repeat phrases that come on a template and sound identical to the company's web pages. The company has also made the mistake of registering supposedly independent Zune fan websites before it ever announced the Zune name. Oops! Remember when bloggers were talking nonstop about "Snakes on a Plane?" All that buzz did little to get people to actually go see it in the theater. Similarly, all the fake excitement isn't helping Zune sales either. Apart from the astroturf sites, Microsoft's Zune has been getting the worst reviews in recent memory, and despite the most convoluted spin in supposed news pieces by Microsoft spinmaster shills, Zune sales have fallen off dramatically. To launch the Zune in the best possible light, Microsoft targeted retailers with the least affiliation with Apple. The flagship CompUSA store in downtown San Francisco didn't get any shipments of the Zune, while BestBuy not only received copies, but made glowing announcements in newspaper articles about having sold several the first day. Outside of the Apple Store, CompUSA has what is probably the second largest display of iPods in the City. BestBuy, like most retailers, also sells the iPod, but apparently would rather sell the Zune, at least as long as it is receiving incentives from Microsoft. 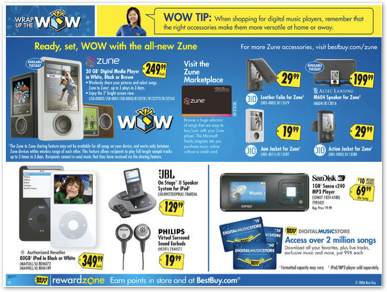 That also explains why BestBuy sent out this flyer promoting the Zune, with the iPod on the bottom listed as being $100 more expensive; the flyer only listed the 80 GB iPod. No mention of the fact that a comparable iPod is not only the same price as the Zune, but is $50 less than Microsoft hoped to originally charge for the Zune! Microsoft and BestBuy must have both contributed marketing acumen on that move. If you can't compete, try a misleading cheat! CNN reported first week sales of the Zune from NPD Group at 11% of the week’s music player retail sales, while rival research group Current Analysis gave Microsoft 7% of the market. Either one sounds pretty good for an initial showing, but other reports of sales activity are less flattering. On its first day of sales, the Zune appeared in Amazon's top ten product list, behind several models of iPod. Within days, the Zune dropped out of the top 50, behind various cameras, iPod accessories, and even, as John Gruber of the Daring Fireball recently pointed out, a record player. Amazon's list of top sellers change hourly, but iPods consistently fill about half of the top twenty slots. SanDisk Sansa players, which place second in market share figures, regularly take two of the top twenty spots, and those devices are priced at $60 and $99, considerably lower than any iPod apart from the Shuffle. When I checked November 30, Creative had one product in the top 25, but the Zune was at 60, behind six GPS devices, two record players, a spindle of blank CDs, and a freaking Palm Pilot. Amazon sells a lot of iPods, but consider the Apple Store. It only sells the iPod. In the last quarter, Apple’s own retail stores pulled in $936 million in sales. That’s a large sales and support force targeted toward selling the iPod, something Microsoft conspicuously lacks. At various San Francisco retail stores I visited on its debut week, it was like pulling teeth to get anyone to show me a Zune, and nobody wanted me to sell me one. It was like shopping for a Performa at Sears in 1996. The next time you hear glowing reports about the Zune, the Xbox 360, or even about Windows Vista's prospects, remember that there's a lot of desperation behind Microsoft's consumer electronics efforts, and combined with Microsoft's history of playing dirty, there is a huge amount of misinformation. Buyer beware. Bill Gates for President? No Thanks. What do you think? I really like to hear from readers. Leave a comment or email me with your ideas.